Belmont’s School of Occupational Therapy partnered with Vanderbilt’s Summer Academy for GoBabyGo, an interdisciplinary collaboration and nationwide program with local chapters that work to provide modified toy cars to young children living with physical, intellectual and/or developmental disabilities like Down syndrome, spina bifida or cerebral palsy. Serving as much more than toys, these cars provide an opportunity for children to move and explore their surroundings in news ways. GoBabyGo fills a significant need by providing low-cost, adaptive, ride-on toys for children. 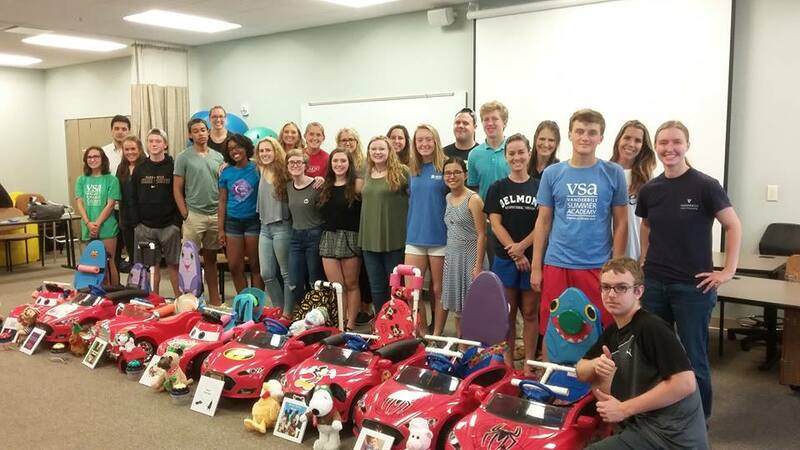 In the Music City chapter of GoBabyGo, occupational therapy (OT) students from Belmont University and high school students attending Vanderbilt’s Summer Academy worked together to modify toy cars for eight children with diagnoses including spina bifida, cerebral palsy and traumatic brain injuries. Each OT student led and worked alongside a small group of high schoolers to assess the specific postural needs of each child and make recommendations for adaptations to the car. Most of the children have physical limitations (unable to sit up without support, limited arm movement/strength, low vision, etc.) that make it difficult to operate the car as it is manufactured. Extra support and modifications like 5-point harnesses, side-railings, bilateral head supports, built up steering wheels and moving the ignition to an accessible location allow for independent use. Once recommendations were suggested, students made the modifications during their 3-week program alongside engineers at Vanderbilt. At the end of the program, all the parties (the children and their families, OT students, high school students and instructors) presented the modified cars to the children at Belmont University. It was a memorable day filled with smiles, tears and lots of pictures. River is pictured in his new car, complete with his favorite character–Mickey Mouse! River, a participant who has been diagnosed with cerebral palsy, required a 5-point harness across his chest to support him while sitting up, a built-up steering wheel to assist with reach, a constructed backboard and the rewriting of the ignition from a gas pedal to an easily accessible button. In time and with practice, River will be able to drive himself around his house and neighborhood, exploring and learning about his surroundings and making friends independently–all opportunities he’s never had before.